Persistence Market Research, in its report titled “Snow making system Market: Global Industry Analysis 2013–2017 and Forecast 2018–2026,” offers detailed insights and in-depth research on the snow making system market over an 8-year forecast period of 2018 – 2026. The report covers important factors driving the growth of the snow making system market, untapped opportunities for snow making system manufacturers, trends & developments shaping the dynamics of the snow making system market, and other insights across various key segments. The snow making system market is classified on the basis of system type, end use, and by region. The value of the global snow making system market is estimated to reach approximately US$ 93.4 Mn by the end of 2018. The snow making system market is expected to register a CAGR of 5.7% over the forecast period (2018–2026). Manufacturers of snow-making systems, through their diversified product portfolios, offer software-incorporated systems to face challenges such as dealing with unfavorable economic conditions and adaptability to weather conditions. Software is installed by companies in snow-production sites, which helps provide a clear layout of complex data and an assessment of the entire process, thus facilitating operation. This software also helps keep track of all the alerts, messages, and faults of the entire control system through a notification center. Complete information about all the snow guns in operation and slopes for the entire snow-making system is provided through this software. Moreover, the “quick view” option displays the current average temperature and current flow of the snow-making system. The most important element of ski area operations is the snow-making process that efficiently works to produce maximum snow output. Snow-making systems, regardless of fluctuating climatic conditions, effectively generate snow in ski areas using less water and energy. Furthermore, a specific weather study is initiated before designing a new or retrofit snow-making system. Along with this, the reservoir, water supply, and pumping capacity of the snow-making system are matched and carefully calculated to meet the desired requirements. Majority of ski areas invest millions of dollars on the installation of snow-making systems. In addition, ski resorts have been proactively implementing systems to adapt to more erratic and frequent winters by enhancing their snow-making capacity by up to 60% over the past two decades. Skier visits are estimated to witness an upward trend across the globe after three years of stagnation as opposed to most markets that are likely to exhibit mature profiles and low renewal of customer base. The Western skier market is likely to flatten. However, the skier market in China is expected to develop majorly, which is estimated to drive the tourism as well as snow-making systems market in the country. In addition, adventure tourism is gaining significant traction across China owing to a nationwide passion for winter sports and Beijing Winter Olympics in 2022, which has significantly increased investments in the snow-making systems business. For instance, in 2015, China built around 108 ski resorts, of which majority are small resorts, and this has boosted the number of ski visitors by 21%. The global snow making system market is segmented on the basis of system type, end use, and regions. On the basis of system type, the global snow making system market is segmented into internal mix, external mix, and fan-based systems. On the basis of end use, the global snow making system market is segmented into ski resorts, indoor stadiums, amusement parks, and others (restaurants, hotels, etc.). 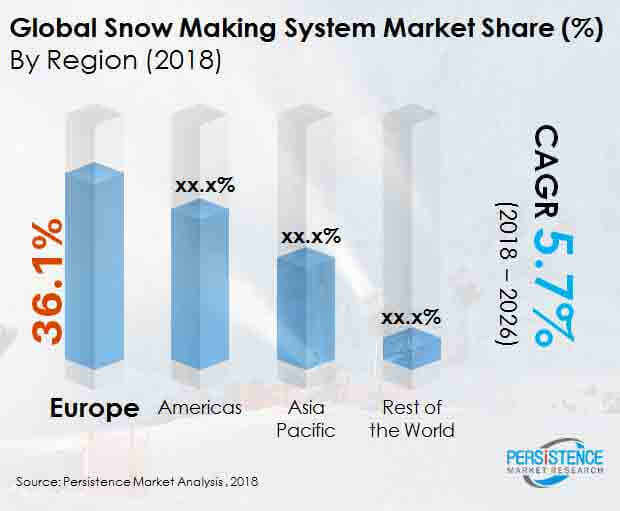 Based on regions, the global snow making system market is segmented into Americas, Europe, Asia Pacific, and Rest of the World (RoW). In terms of value, the fan-based snow making system segment is estimated to dominate the market with 62.7% by the end of 2018 and expected to remain dominant during the forecast period. The global snow making system market is expected to account for US$ 145.8 Mn by the end of 2026. By end use, the ski resorts segment is estimated to dominate the market in terms of value with a share of 86.7% by the end of 2018.